We just can’t constrain ourselves to share this with you before we plunge into the weekend. The .gif below shows a night scene with a couple of new effects that add to the atmosphere of the game. Notice the mosquitoes flying around the lights, the gusts of wind, and the rain drops that make a splash as they hit the ground. These details make everything feel much more alive. Longtime followers of this blog might remember this one: the ‘floaticles’ are back! As you can read in this article, floaticles are essentially particles that are a bit smarter than your average particle; they increase the spatial awareness effect that makes you feel as if you’re walking through a cloud of floaticles. 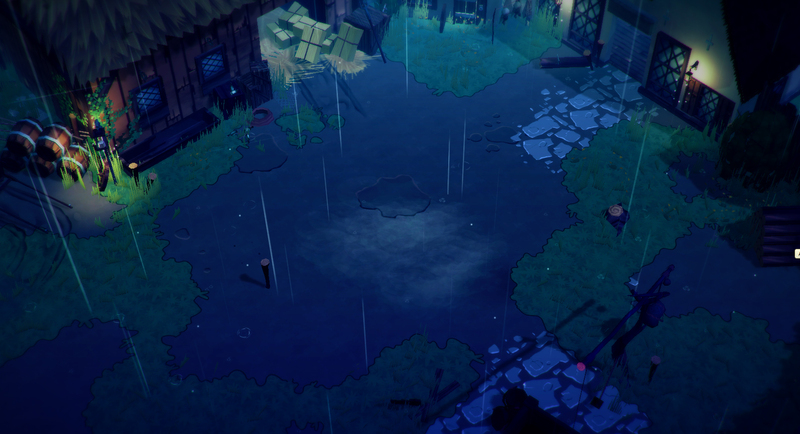 In the middle of the square, some mist can be seen which will be added to other locations in the game as well, like over water and farmland. These veils of low hanging mist are a common sight in the Netherlands and some people find it quite spooky. It’s not a coincidence that this mist is also called ‘Witte Wieven‘, who are white spirits from Dutch mythology. Nowadays the mist is just a nuisance to many car drivers though. Keep up the good work and keep us updated! USS: The Butcher has allready been taken care of! If I remember correctly it was one of the first models we’ve shown, way back when.